Over the last few years obesity has become a worldwide health and healthcare issue. Food tracking might help to solve this problem for some people, but the effect of self-monitoring methods can be ambiguous due to several behavioural factors. The behavioural factor of interest in this study is being (dis)honest about eating behaviour, which can be caused by social desirability bias. 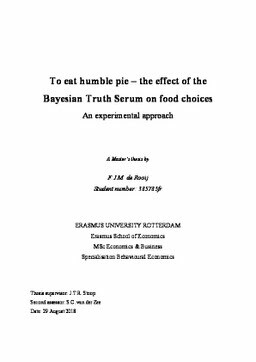 This thesis examines whether people make healthier choices if they are incentivized to be honest about their eating behaviour, by using the Bayesian Truth Serum. An electronic questionnaire is used to elicit current self-reported food intakes, and to let the respondents make hypothetical meal choices. About half of the respondents only had to report their own answers, whereas the other half had to answer the questions according to the Bayesian Truth Serum method. No evidence is found that the respondents made healthier food choices if they were exposed to the Bayesian Truth Serum, nor that they reported their current intakes more truthfully. Thus, incentivizing honest behaviour does not generate healthier decisions. These findings indicate that the Bayesian Truth Serum is not an effective measure to improve food-tracking methods to help solve the obesity issue.